What is it Agile Order recoery? 1. This is free addon of AdminCarts.php that allow store owner to generate order from existing cart in just one easy click. 2. 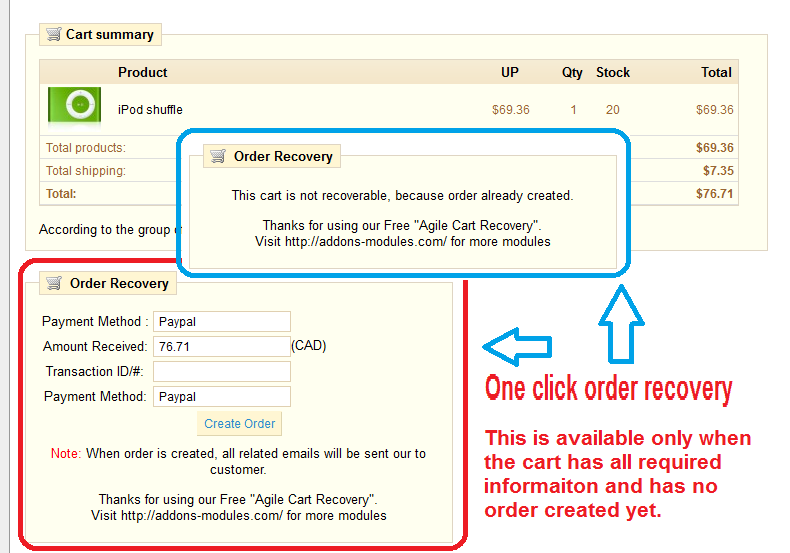 This modification will show a GUI on cart detail page that allow generate order from existing cart. When you should use this added function? Use case 1: If you want to create orders manually for your customer, you can use front office to signup and create cart, then go back office use fucntion to generate order in just one click. use case 2: Because of system trouble (most scenario is payment system), customer placed the order and paid the order, but system was not able to create the order. A .for 1.3x: [Tools] - [Tabs], find "Carts" record and click edit icon. for 1.4x: [Employees] - [Tabs], find "Shopping Carts" record and click edit icon. that's it, you are all set. 1. 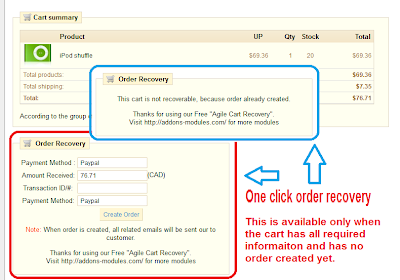 If an order has been created from the cart, then you are not able to generate from this cart. 2. if there is not enough information, for example, no customer information, you will not able to generate order from the cart.